Mare Nostrum, Europa Universalis 4's naval expansion, is out now. 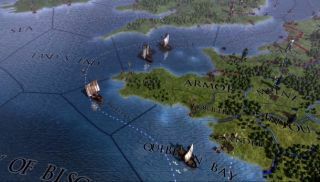 You can take to the waves on missions that tone down naval micromanagement, join trade leagues with lesser nations for common defence and profit, rent out your standing armies as mercs, and go raiding along the Barbary Coast. Mare Nostrum also revamps Europa Universalis' underwhelming espionage system—no longer will you dispatch a diplomat to tell lies about Britain's rightful claim to Normandy. Rather you'll need to invest time building a spy ring within enemy nations, calling on it only when the time is right. Mare Nostrum is £11/$15 on Steam, but if that doesn't float your boat, each EU expansion is accompanied by a free patch for all. One crucial feature in 1.16 is the requirement for sailors drawn from the population to pilot ships. Google's self-driving galleons still had a way to go in the early modern period. Big ol' patch notes here.